Fashioning casual, comfort-driven pieces is Howies’ stock in trade, so it’s no surprise that the British retailer’s Polly cardigan is the perfect foil for April showers. Stitched from 100 percent organic cotton, the sailor-striped topper comes in red or banana. (Both have plenty of navy accents to spare.) Although sometimes made in China, Howies’ wares don’t translate to “made in a sweatshop.” Not only is each garment labeled with the place it was manufactured, but Howies also assesses its factories regularly to ensure that labor conditions are safe, fair, and non-discriminatory. Fashioning casual, comfort-driven pieces is Howies' stock in trade, so it's no surprise that the British retailer's Polly cardigan is the perfect foil for April showers. 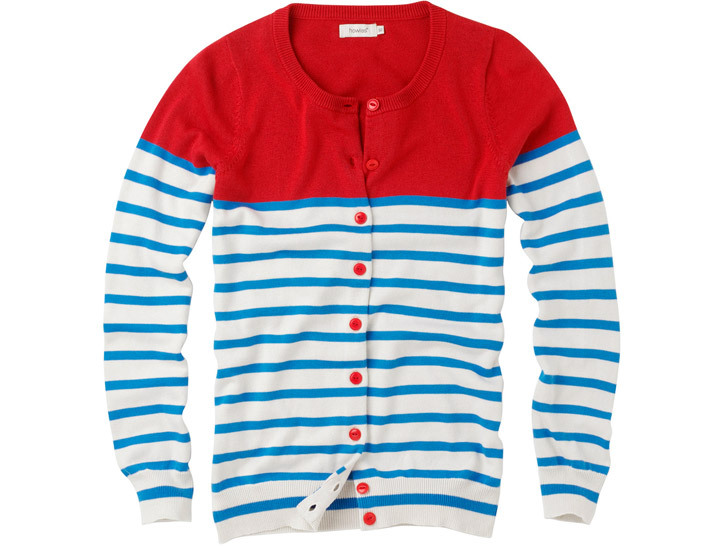 Stitched from 100 percent organic cotton, the sailor-striped topper comes in red or banana. (Both have plenty of navy accents to spare.) Although sometimes made in China, Howies' wares don't translate to "made in a sweatshop." Not only is each garment labeled with the place it was manufactured, but Howies also assesses its factories regularly to ensure that labor conditions are safe, fair, and non-discriminatory.